If you have an MHL-compatible smartphone or tablet, you can connect it to the projector using either an MHL cable or an HDMI cable with a device-compatible MHL adapter. 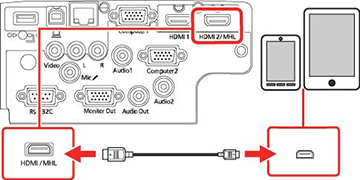 If you have a device with a built-in MHL connector, plug it directly into the HDMI2/MHL port. Connect the other end of the cable to the projector's HDMI2/MHL port.